An ideal set to work with irregular objects. 3 Tool maker clamps - adjustable up to 2", 2.5", 3" - great to have all 3! Helps to precisely hold work together for tapping, drilling and wood working. The area between screw and edge for clamping is approx. 1-1/8". 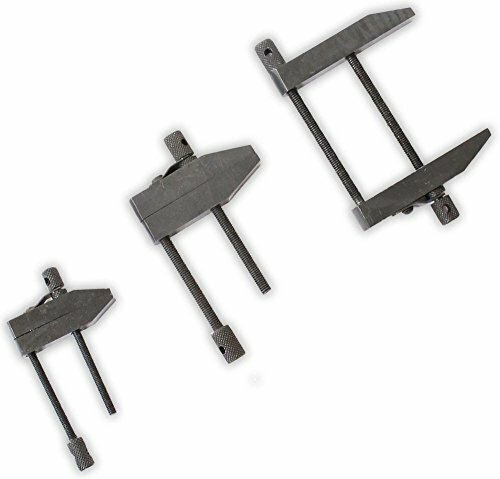 Clamps have black oxide rust resistant finish making it a tool you can count on. The knob used to turn the screw has texture for proper grip and clean turning. 3 Tool maker clamps - adjustable up to 2", 2.5", 3" - great to have all 3! Area between screw and edge for clamping is approx. 1-1/8"
Black oxide rust resistant finish - a tool you can count on!